If an ordered item is out of stock or marked with ETA/BY ORDER it will be placed on backorder or partial backorder (which you will be able to see on the Order Information page accessed from the My Account page). An estimated time of arrival (ETA) will be specified in the Order History where available. BY ORDER means an item is never held in stock and must be ordered in specifically for your order, which means it will generally take a bit longer. Please contact us for details of your specific item. If you do not wish to wait, please contact us and we will refund you for the items (although we may pass on any cost associated with ordering the item in specifically for you). You purchase a product which has stock as "ETA" or "BY ORDER"
When one of these conditions occurs at the time of purchase and you see your order status remaining as Shipping, Back Order or Partial Back Order for a period of more than 3 days without further information on the ETA, please contact us to discuss available options (i.e. Keep the order and wait for the item to arrive in stock or cancel the order (or part) and immediately receive a full refund for the unshipped items). Please note, there may be additional shipping costs if you request a partial shipment of your order. To track your order, please log into our website with your account and look at the My Account page. You will be able to see the status of all your orders. We also use the My Account page to display any additional information about your order. Please check the order progress regularly and contact us if there are any issues or concerns. Credit Card Handling Fees - For order cancellations paid for by Credit Card (NOT PayPal), the Credit Card Handling Fee of 1.5% is not refundable, as this fee is charged by the bank and is not refunded to us when an order is cancelled and we have to issue a refund. Only applicable to orders with a minimum product value of $500. To find out more please see our Flexirent page. MegaBuy takes no responsibility for any delays associated with processing your payment by third-party financial institutions. MEGABUY or MEGABUY PTY LTD will appear on your credit card statement for orders placed with us. MegaBuy Technology Superstore uses the industry standard security protocol Secure Sockets Layer (SSL) to encrypt all sensitive information (like your credit card details) that passes between your computer and the MegaBuy Technology Superstore website. We employ the latest 128-bit encryption technology in all areas of the site which require you to provide your personal or account information. This means that the credit card information you send is encrypted by your computer, and then decrypted again on our side, preventing others from accessing your private information in transit. So, when using an SSL capable browser, shopping on the MegaBuy Technology Superstore website is perfectly safe. Also, when your provide credit card information on our website, it is passed directly to the bank via an SSL secured payment gateway and is at no stage stored on our website or in our database. This means there is no risk of your credit card information being stolen, even in the highly unlikely event of someone gaining access to our database. Shipping charges apply to all orders placed. Our shipping cost is calculated on the weight, volume and delivery post code for every order. 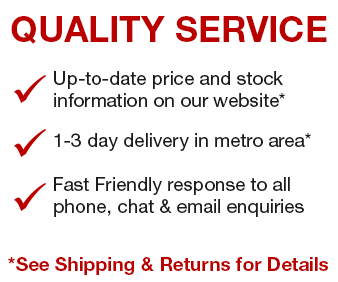 Shipping and dispatch times on our website are indicative only. To avoid delays and possible second delivery charges, we strongly recommend that you provide an attended business address (such as a work address), where someone you trust will be available to receive and sign for the order during normal business hours. Normal delivery times for items in stock are 1-2 days from payment clearance. These timelines are guidelines only. Megabuy does not take any responsibility for any delays in shipping. Where possible we provide consignment details and courier tracking numbers to customers (in the order status), so please contact the corresponding courier to track your shipments. You should check the Order History on the Order Information page accessible from the My Account area for information on your order. These promotions are in no way under the direct or indirect control of MegaBuy. Manufacturers will place set time frames in which these promotions are current and valid, and we have no ability to extend these times. We may still offer products for sale after the promotion has expired, and the promotion shall not be redeemable. BEFORE returning any faulty goods to us you must initiate a return / warranty claim with our Service Department from My Returns / Warranty Claims section of the My Account page. You must select the faulty item from the list of products you have purchased and provide the faulty item's serial number (for those items that have a serial number) and as much information as possible about the fault / problem. Where appropriate, we will issue you with a Return Authorisation Number (RA Number) and provide with instructions on returning the faulty item. The RA Number is generally valid for 7 days from the date of issue, in which time the faulty goods need to be received by our Service Centre. If the faulty goods may not be returned within 7 days please advise us as soon as possible so that we can contact and advise the Service Centre to take steps to ensure the goods are not rejected at delivery. The RA Number MUST be clearly displayed on the return package. Any goods returned without an RA Number will be not accepted and shipped back to you at your expense. Depending on the item we may require that it is returned with all original accessories (i.e. Power supply, cables, I/O shields, controllers, adapters, etc) to enable the faulty goods to be properly tested for the specified fault. The Service Centres reserve the right to reject incomplete or poorly packaged items where poor packaging may have resulted in damage to the item. A refund for the amount paid for the item or a replacement item will be provided at our discretion for any goods returned under Express Store Warranty where the Express Store Warranty provide a remedy over and above the rights you have under Statutory Warranty provided for by the ACL. For claims under Statutory Warranty your rights are as provided by the ACL depending on whether the goods have suffered a major or a minor failure. A refund or replacement item will only be issued once the faulty item has been received and tested for the specific fault / problem specified in the Return / Warranty Claim and found to be faulty. If a product is sold in a bundle with another product only the faulty product will be replaced or refunded with the non-faulty products valued at the individual product price as at the time of the purchase. You must go through Return / Warranty Claim procedure outlined above in order for us to process your return / warranty claim. If the item is found faulty, we will either replace the item or refund the full amount of the order based on your choice. To ensure expedient handling of your DOA return please initiate the DOA return within 7 days of receiving the product. All products sold by MegaBuy are covered by Statutory Warranty, Express Store Warranty and/or Express Manufacturer Warranty. Most of the goods carry 12 months Return-To-Base Store Warranty or Express Manufacturer Warranty, but some, like monitors, could have an Extended Manufacturer Warranty. Please contact the product manufacturer for Extended Manufacturer Warranty details. As provided by the ACL it is up to you as the consumer to decide whether to deal with us or directly with the manufacturer with respect to your warranty claim under Statutory Warranty. However, where the manufacturer has a service centre network in Australia you may find it more efficient to handle the warranty claim directly with the manufacturer as we may not have the facilities or the expertise to test the product for the specified fault and would ultimately have to return the product to our supplier who may in turn need to return it to the manufacturer for testing and dealing directly with the manufacturer will avoid the delay of the product being handled through the entire supply chain. This process may add up to 4 weeks of extra handling time. PLEASE NOTE! All Ex-Gov products have a 30 day warranty only. MegaBuy does not accept any responsibility for any data loss caused by the product purchased from us. Terms and conditions are subject change from time to time without prior notice. It is your responsibility to review the terms and conditions prior to placing orders on the website.